Put those heavy winter coats away! While it is finally starting to warm up, it's not quite jacket-less weather. 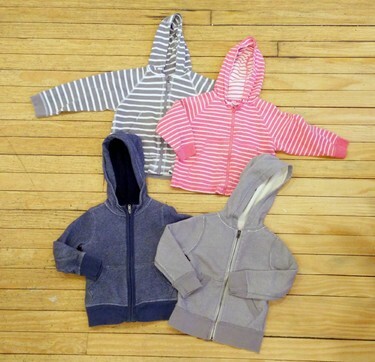 Opt for a lightweight jacket or hoodie to keep your little one warm on these cool days. We've recently pulled all our Spring coats out from storage, so we have lots of options. Lots of different hoodies to choose from. Everyone's favorite lightweight, packable jacket. Got more of a rebel youth? How about a leather jacket for that attitude? Top Left: Bomber by TDM'966. Size 18mo, $29.99. Spring coats for special occasions!